Baby arrived six weeks early and is spending some time in the NICU getting bigger and stronger before coming home. The showers have been cancelled but we appreciate the outpouring of food, gifts, and well wishes from friends near and far! Updates soon! 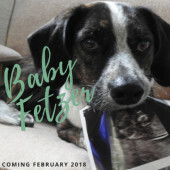 As most of you already know, last year we learned that having a baby naturally probably wouldn't be in the cards for us. We were very surprised, and excited, to learn that that wasn't the case! This year has been a wild ride and we can't believe we'll be meeting our little one in just a few months! Thank you so much, to everyone, for the well wishes and for helping us get ready for our little girl. And should you happen to have any of these items already, we (and the environment) love second-hand just as much! !